The Riney Fine Arts Gallery is conveniently located between Sebits Auditorium and the Fine Arts Office. Stop by the gallery anytime because the schedule is filled with a wide variety of artists who are sure to challenge you through their visual interpretations. Final Friday receptions are scheduled for each art show on the last Friday of each month from 5-7 p.m. (unless otherwise noted). Regular gallery hours are Monday-Friday, 8 a.m.-6 p.m. This free event helps high school juniors and seniors prepare an art portfolio to apply for art scholarships. 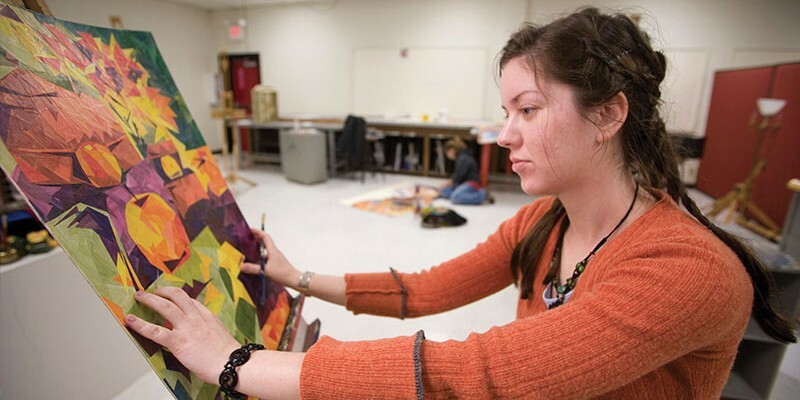 Students work on their portfolios in graphics, studio art, media or art education. Professional speakers, as well as current students and faculty, lead participants through the process. This year’s guest speaker will be Dominic “Dangerdom” Flask, product Illustrator at Coinbase. Flask is a designer and illustrator who works hard to make the world a beautiful and more interesting place to live in…one small piece at a time. He has crafted delightful pixels for the likes of Dropbox, Uber, Facebook, Google and a wide variety of technology startups. Lunch will be provided. To register, please call 316-295-5548.